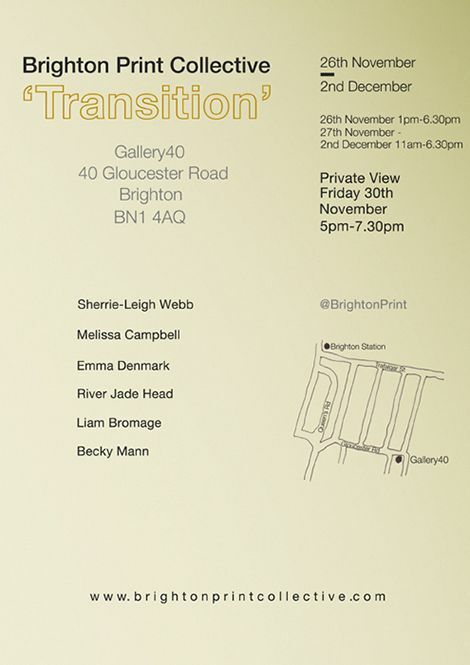 An exhibition of work by members of Brighton Print Collective will be showing at Gallery40, Brighton from November 26th until December 2nd. 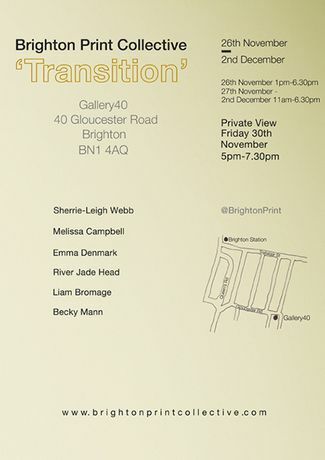 The Private view is being held 30th November, 5-7.30pm. Showcasing works made during their transition from under to post graduate, the exhibition will offer affordable original prints from award winning recent graduates of the University of Brighton: Liam Bromage, Melissa Campbell, Emma Denmark, River Jade Head, Becky Mann and Sherrie-Leigh Webb. Exhibiting artists explore a range of Printmaking techniques from Screenprint, Woodcut, Aquatint Etching, Monotype and Digital Print.